Road Runner Moving is the first moving company in the United States to develop and dispatch specially trained Emergency Response Teams directly into the most hard hit areas. We start out helping with Search & Rescue, Transporting Essential items into impacted areas, and then assist residents with salvaging non-damaged priceless possessions so the repair work can begin. Porsche (shown above) is a 4 year old German Shepherd import from the Czech Republic working with local law enforcement and search & rescue teams in Beauregard, Alabama on March 4, 2019 after the deadly EF-4 tornado struck Lee County, AL killing 23 residents. After a natural disaster happens, the first to respond is our search and rescue team. Equip with Porsche, our 4 year old German Shepherd import dog with advanced search & rescue and cadaver dog training. Our teams partner with both law enforcement and local fire and rescue teams to help save lives, clear areas for power companies, and whatever else needs to be done in the hours and days immediately following a storm. With multiple trucks dispatching from Birmingham, AL, we are able to take necessary essentials from local donation centers (ie The Church of the Highlands, American Red Cross, etc.) like bottled water, food, and clothing directly into the impacted areas to staging areas set up by local law enforcement agencies and non-profits. After law enforcement officials have cleared the area for residents to start coming back into disaster zones, our emergency response team provides emergency moving and packing services with a goal of salvaging priceless possessions not damaged by the storms. Our teams are equip with thousands of boxes, packing paper, tape and all the necessary items to pack up a home and transport it to storage. We work directly with most insurance companies as well as working along side third-party restoration companies like SERVPRO and ServiceMaster Restoration. The goal is to salvage items as quickly as possible and transport them to offsite storage facilities. Road Runner Moving emergency response teams loading household items from a 26 unit residential complex into self storage in Surf City, North Carolina after Hurricane Florence in October 2018. We were able to remove all salvageable items within 4 days so that SERVPRO teams could begin demo and water mitigation work. 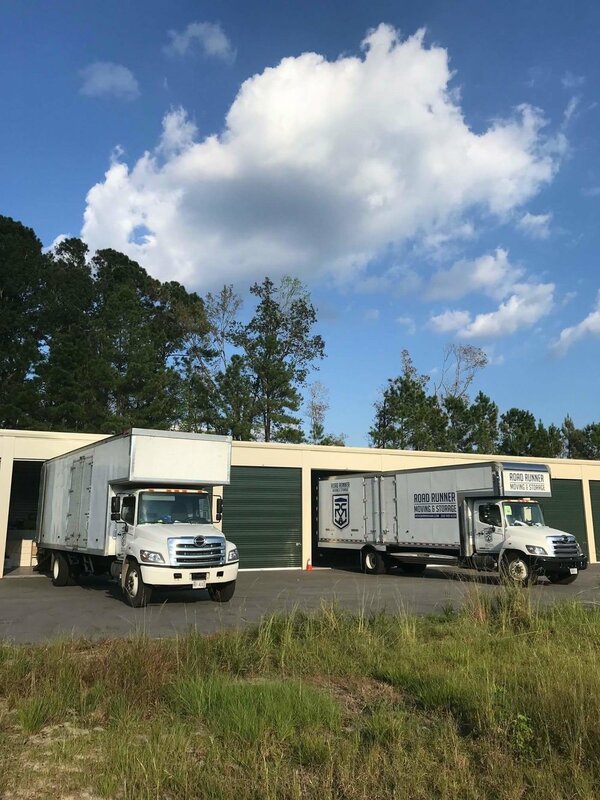 Please note: local self storage facilities fill up extremely FAST, so it is common that our teams must transport your items hundreds of miles to the nearest available storage facility. Storage is 100% arranged by the customer unless going to our 30,000 square foot facility in Birmingham, AL or being stored in one of our MOVR bodies (shown below). The law simply does not allow us to arrange (or sign for) a self storage unit (due to the laws implemented post 9/11). We are however usually able to provide a list of available units for which you can pick and choose the right storage solution for you. Road Runner Moving MOVR BODY set up in front of Bed, Bath & Beyond after Hurricane Michael ravaged Panama City and Mexico Beach, FL in October of 2018. Our teams spent several months staged with law enforcement teams completing numerous residential and commercial projects after search and rescue cleared areas. Your Road Runner Emergency Response Team is here to listen to your needs, provide realistic solutions and make the entire process of clearing out your home, office, or business much easier. We can handle any sized job, from large retail stores to multi-unit residential complexes. Road Runner Moving truck shown in Top Sail Beach, North Carolina after Hurricane Florence made landfall in September 2018. Our teams spent nearly 4 months in North Carolina after the storm helping hundreds of residents from Wilmington, NC to Jacksonville, NC. In business since the late 1970’s, we have been taking the stress out of moving day for over 40 years. Our ERTs (Emergency Response Teams) are dedicated to going above and beyond during this difficult time. We would encourage you to connect with us directly and see how we can help. Click Here to reach our call center.